I have always been skeptical of esthetic salons. It seemed to me that their TV commercials were always too slick and catered only to the rich. I had noticed a few age spots on my skin that had appeared over the last few years. I thought it was natural and was not too concerned. However, I changed jobs and all of a sudden found that I was constantly giving presentations in front of large groups of people. Appearance became very important. I tried to cover the age spots with make-up to no avail. The time had come. I had to do something about them. After a month flipping through the yellow pages and newspaper ads, I decided to pay a visit to a salon called Come Across. I called the shop and the lady who answered the telephone sounded really nice. I told her about my problem with the age spots and she suggested I come in and see her. So I made an appointment. I nervously looked for the shop on the day of my appointment, subconsciously hoping that none of my friends would see me. To my surprise the location was in a residential area away from the main street at a very discreet location. I was greeted by relaxing background music and the friendly smiles of the employees. First the esthetician sat down with me and explained all the available services like facials, massages and weight control programs, and their prices. I told her that I wanted to get rid of my age spots. 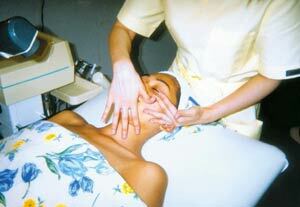 She listened closely to my concerns and them suggested a treatment personalized just for me. Since that first day, I just love to visit “my esthetic salon,” Come Across. My friends noticed the improvement of my facial skin condition almost tight away, and asked me what I had done. As a result, nearly a dozen of my friends made a call for their own appointments, and all said that they were glad that I told them about my little secret. After a couple of months of treatment, my age spots have all but disappeared. Even people I barely know at work stop me and ask how I got the age spots cleared up. I was skeptical at first, but no more. The staff at Come Across speak enough English to communicate. You can pay at the time of your visit, or purchase certificates and take advantage of savings that are offered. The certificates are available in books of 10 or 20 and are really a great deal. The salon is open daily from 10 a.m. to 8 p.m. except on Sundays and Japanese holidays. Call 983-7741 for an appointment.